Healthcare facilities have long been a great challenge for architects and designers, from the age of extreme sanitation and functionalism to evidence-based and user-defined environment. In Thailand, during the past decade, many hospitals have gone through a face-lift renovation that left healthcare practitioners scramble for equipments and patients with larger bills. Functionality had been compromised in order to compete with other hospitals that allowed waiting chairs to be upholstered with real fabric instead of the usual vinyl or leather. Warm ambient interiors of hospitals in the 1990s became the dominating style. Pediatric Departments often enjoyed the most attention from designers as they allowed more design freedom guided by Piaget’s theory in child development. Colorful furniture and play area became a must for most hospitals. Today, however, healthcare practitioners had learned the hard way that hotel-style interiors do not always work with hospital functions. Therefore we are seeing a new wave of renovation of hospitals in recent years. Designers as well as hospital owners have now developed a better understanding of how to accommodate healthcare functions while allowing aesthetic to play a role. Evidence-based theories in interior design is now facing a new challenge to answer new questions posed by today’s society. Patients’ approach to healthcare has changed and many have turned to holistic treatments. Hospitals today must also change from a place for curing deceases to a place that heals body, mind, as well as spirit. Today, evidence-based design is being questioned in many notions such as the obscurity of criteria for physical features that left designers in the dark when it comes to design application. Further, as hospitals in Asia have become more than a place for healthcare but an important part of tourism industry, owners and investors seek for alternatives in design approach. One of the trends is to redefine hospitals as a place that provide hospitality services hence the emergence of the borrowing of concepts used in hospitality design. This new consumer-based design is starting to take shape especially in aesthetic medication such as dermatology and plastic surgery where medical functions are less complex. Consumers became the center for design hence the more vivid use of colors and patterns that resemble retail shops. The new dermatology and aesthetic center of Serirak Hospital clearly exemplified this new trend in health care design. The interior architect, Chananya Apiwatpong, intended this new extension to be a “pleasant” place for patients and healthcare providers alike. The planning was tailored to the functions prescribed by doctors and nurses who reflected on their experiences which were used to shape rooms and allocations of furniture. 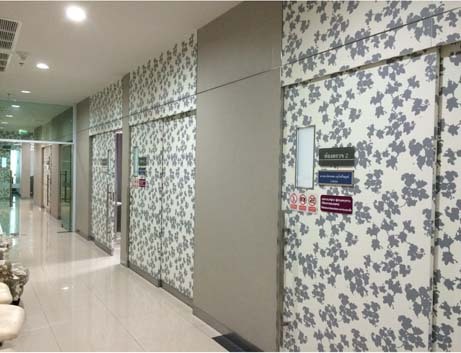 Instead of the usual hygiene look, bold floral pattern was used on the panels to add life to the otherwise sterile waiting area. Stylistic furniture also toned down the cold ambient. The gallant decision was encouraged by the owner of the hospital who wanted to provide patients with special treatments apart from the usual services. This radical break from conservative design is a starting point in the development of design methodology for health care facilities that gears toward consumer-centered design instead of the prominent evidence-based design of the twenty first century. Jeff Goldsmith, “The Paradigm shift: Transforming from an Acute to Chronic Care Model.” Decisions in Imaging Economics (1990): 13-19. Nicholas J Watkins, “the need for consumer-driven research.” Asian Hospital & Healthcare Management. Accessed June 4, 2014, http://www.asianhhm.com/facilities_operations/healthcare_design.htm. Keywords: Evidence-based design, consumer-centered design, alternative approach in healthcare and interior design. Attitude change toward illness as more attention is given to chronic illness and lifestyle change became the key in healthcare. Jeff Goldsmith, The Paradigm shift: Transforming from an Acute to Chronic Care Model, Decisions in Imaging Economics (1990): 13-19. Nicholas J Watkins, the need for consumer-driven research, Asian Hospital & Healthcare Management, http://www.asianhhm.com/facilities_operations/healthcare_design.htm. Semiology in general is a study of signs and sign-using, especially in language. Semiotics also studies of non-linguistic sign systems that can be applied in architecture in the sense of tracing Thai traditional architectural elements resonate in contemporary Thai architecture. As in the modern language, an expression of a meaning is vital to its message; architecture can evolve and reinvent the known elements into the new array of possibilities under the constraints of the context, tectonic, and materials, which will open the door for an innovated architectural typology. Thai traditional architecture grows organically from country situating, which Thailand is located in Tropic of Cancer; where the climate is temperate throughout the region annual temperature that dwellings are responded to meet specific needs, accommodating the values, economies and ways of life of the cultures that produce them. Thai architectural elements such as gable or hipped roof, eave, sunscreen and roof details are parts that transform from past to present in Thai architecture that both function and semiotic meaning reflecting Thai cultural setting. The shape and form of the house from past to present is the representation of semiotic traditional elements into the contemporary house. Willow 49 designed by Architect, Suparath Valisathien, took national pride (architectural elements) and reorganized architecturally to answer contemporary constraints of context, tectonic, and materials. Thai house in contemporary urban context shifts from horizontality to verticality that spaces are reorganized and built upon a common platform, terrace, that the resonances of semiotic architectural elements are grown upwardly by using modern materials that the essences of the past exhibit, but living conditions are modern that modern house typology has been created. Semiotic message should go vital to all habitats of Willow 49 that “A house becomes a home” for locals and foreigners that they will be recognition for both physical aesthetic of Thai architectural elements that linked the past to the present; and psychological comfort in tropical sustainable that are presented in this Thai contemporary typology. Oliver, Paul. Dwellings. London: Phaidon Press Limited, 2003. Ryder, Martin. “Semiotics: Language and Culture.” University of Colorado. Accessed July 28, 2014. http://carbon.ucdenver.edu/~mryder/semiotics_este.html. Sthapitanonda, Nithi, and Brian Mertens. Architecture of Thailand: a guide to traditional and contemporary forms. Bangkok: Asia Books Co., Ltd., 2005. Architecture can evolve and reinvent the known elements into the new array of possibilities under the constraints of the context, tectonic, and materials, which will open the door for an innovated architectural typology. Martin Ryder, “Semiotics: Language and Culture,” University of Colorado, accessed July 28, 2014, http://carbon.ucdenver.edu/~mryder/semiotics_este.html. Nithi Sthapitanonda and Brian Mertens, Architecture of Thailand: a guide to traditional and contemporary forms (Bangkok: Asia Books Co., Ltd., 2005), 229. Paul Oliver, Dwellings (London: Phaidon Press Limited, 2003), 14.